After morning pickup at select hotels or designated meeting location in Tokyo, relax as your deluxe coach cruises along a scenic 2.5-hour route to Mt Fuji Visitor Center. Learn about the history and geology of Japan’s highest mountain from your guide and the informational exhibits about the revered mountain. From the second floor observation deck, you can get great views of Mt Fuji on a clear day. After seeing the Visitor Center, return to your coach and proceed to Mt Fuji’s 5th Station, located about halfway up the mountain at 7,545 feet (2,300m). Take in the shrines, torii gates and shops that sell souvenirs, along with views of Mt Fuji and the surrounding lakes (subject to weather conditions). Soak in the invigorating atmosphere of 5th Station; you might even spot some climbers preparing for their adventure. Then have time to enjoy Japanese-style lunch (if you select the "+ Lunch" option at checkout). Otherwise, you have the option to buy your own meal. After having a bite to eat, drive to nearby Lake Ashi, located in Hakone National Park. Step aboard your boat for a short cruise across the lake. Admire the spectacular scenery of pristine waters surrounded by Mt Komagatake, Mt Fuji and other mountains. Disembark from the boat and head to the Mt Komagatake Ropeway, an aerial tram that takes you from the shores of Lake Ashi to the top of Mt Komagatake. Have time to walk around the mountain top and take in amazing views of Lake Ashi, the Owakudani volcanic valley and majestic Mt Fuji. 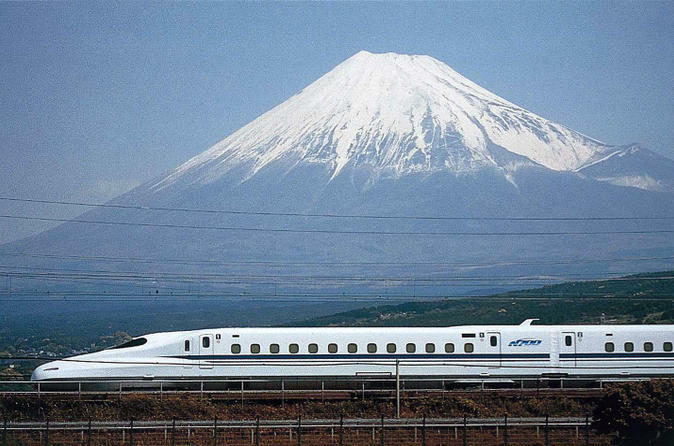 After visiting Hakone, transfer by coach to the evening bullet train (Shinkansen) for your return to Tokyo, where your guide will tell you how to get back to your hotel. Please note: Views around Mt Fuji are always subject to weather conditions as mountain weather is notoriously unpredictable. Visibility tends to be better during the colder months, in the early morning and late evening.